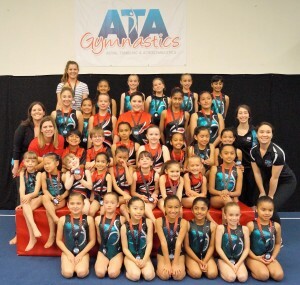 Acro Pre Team is a great way for kids to be introduced to Acrobatic Gymnastics. Participants learn elementary acrobatic and dance skills which are then put into a choreographed routine to music. Over the Pre Team Acro season (12 to 14 weeks) they will work on learning and perfecting basic partner and individual skills. The season includes two performances where everyone works together to learn a group routine. They will also learn an individual pair or group routine to be competed at a final in-house meet in our facility. This gives the athletes a chance to gain performance and competition experience. Individual pair/group routines will be performed in front of judges, receive a score and be awarded a participation medal. Individual awards are also presented to athletes at this event to recognize some special accomplishments over the course of the entire season. Acro Pre team is an excellent way for children to belong to a team, enjoy learning basic acrobatics in a session format, and gain personal confidence without having to commit to the cost and time investment required by a competitive season.